It is common for offices, factories, call-centers, hostels, schools and hospitals operate their own cafeterias for their employees and students. It is challenging to manage the cafeteria menu, attendance and consumption. Manual and paper-based processes are cumbersome and error-prone leading to inaccuracies and wastage of time and material. Matrix COSEC CENTRA Cafeteria Management software is a completely automated solution starting from placing an order to delivery and including payments. Cafeteria Management allows menu item tracking, fast transactions, prevents accounting errors and reduces wastage of food. Cafeteria Management allows administrator to create up to 255 menu items to accommodate different types of food items offered in the cafeteria. One menu can contain up to 30 such items. COSEC allows creation of 9 different menus. Administrator can schedule above menus for specific dates, days and times. Thus, different menus can be planned for breakfast, lunch and dinner and special days and occasions. On the predefined date-time, COSEC displays the pre-set menu on the screen of the device. User can select any item from the menu and order required quantity. This function is useful when the cafeteria serves one item as the complete lunch/dinner meal or want to offer the most selling items as the default item. One item per menu can be defined as a default item and it will be displayed on the top. User need not navigate through the menu to order the auto-selected menu item. He can order the item just by showing his credentials. Matrix COSEC Cafeteria Management offers postpaid and prepaid accounting options for users to make cashless cafeteria process. Prepaid account users have to recharge their smart card in advance before ordering food. On the other hand, postpaid users can use any credential including fingerprint, proximity card or smart card to order food. In both the methods, the amount is debited in the user account without any monetary transactions. It is possible that when a user orders an item shown in the menu and cafeteria cannot serve it due to stock-out or other reasons. It is also likely complete order cafeteria cannot serve the entire order and offers only few items or partial quantity from the order. Cafeteria Management allows correcting such orders from the Employee Self Service (ESS) portal. Prepaid users can recharge their smart card using COSEC ENROLL CARD or COSEC Door Controller from an authorized person. Recharged amount can be checked and verified on COSEC devices. Using attendance data, food and material can be planned in advance to reduce wastage. The Cafeteria Management tracks the food consumption item-wise and also for a group of users. For example, admin can check daily and monthly consumption for individuals or departments. Postpaid users are blocked when their consumption has exceeded the pre-fixed amount limits set by the admin. Such users can be reinstated by depositing either part or full payments. Both prepaid and postpaid users can check their consumption in real-time using the COSEC Employee Self Service (ESS) portal or COSEC Mobile Application. They can track their daily or monthly food expenses with item-wise consumption. If they detect any erroneous entry in their account, they can request correction. Matrix COSEC devices with USB port can be connected directly with any standard printer. COSEC can print a receipt for each user transaction detail like items, rate and quantity. Receipt can also contain organization name. COSEC Cafeteria Management module can send data directly to any third-party payroll, ERP or other billing application, thus avoiding the need for manual data entry or data transfer saving time and eliminating the possibility of human errors and manipulation. Payroll can use this data to deduct the cafeteria amount from the user’s salary. 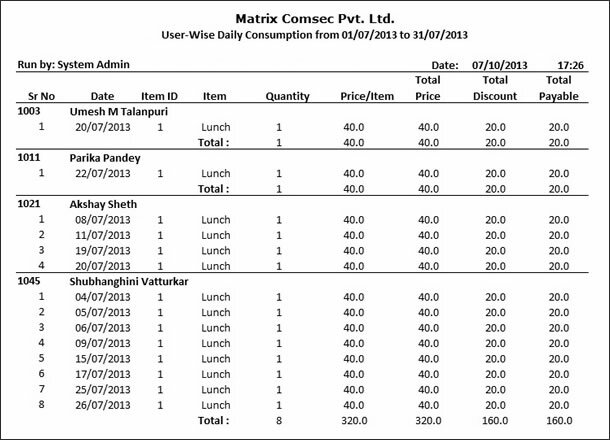 Cafeteria Management generates user-wise consumption reports with customized fields in required formats. Administration, HR and finance can generate 30+ informative cafeteria reports by applying various filters to monitor user-wise, department-wise, daily and monthly consumption and expenses. They can also analyze item-wise consumption and transaction details. Reports are available in various formats like PDF, Excel, Word, Text, RTP and CSV.